Which day did Christ and the Apostles observe? Which day did Paul teach Gentile converts to observe? How did the day become changed from the seventh to the first day of the week? WE have been reared in a Sunday-observing world. Naturally, we have taken Sunday-observance for granted. 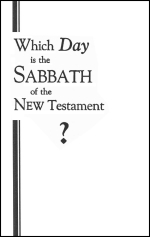 Naturally, the idea of a different day as the true Sabbath-day strikes us as fanatical and absurd. Yet today some are telling us SATURDAY is the right day. They insist the SEVENTH day is the only day the Bible anywhere commands us to keep. They even claim we are sinning - that we have the "Mark of the Beast" and shall suffer the seven last plagues - if we observe Sunday instead of keeping the seventh day. Many False Prophets. Jesus warned that many false prophets would appear, deceiving many. So what is the TRUTH? How can we know?